According to 'Teenbeat Mayhem', The Charles hailed from Williamsville, NY. There are a few YT uploads and some other information on the internet advising that the record was released in 1966. This is wrong. The recordings took place sometime in 1969. "Motorcycle" is a tough rocker with heavy organ, decent guitar leads, harmonies and what I like best "handclaps." 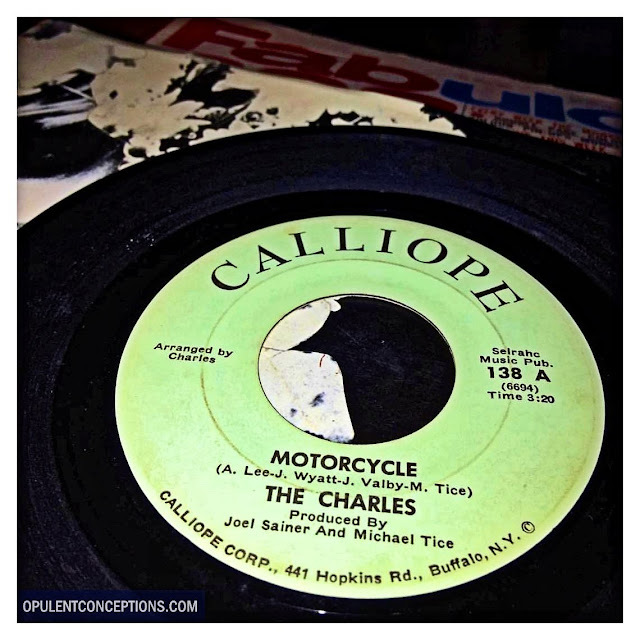 The song portrays a biker gang, one of them murders someone, then they take off on their bikes. The flip, "Down By The Riverside" is a very different sound altogether, reminding me very much of The Lovin' Spoonful. Both sides are decent and it's a record to look out for. "Motorcycle" has been compiled on "Scum Of The Earth"
John Valby from The Charles still performs today. Nice score. I've had this one for a while and considered it one of the better local 45s. John Valby a/k/a " Dr. Dirty" does still perform doing the same off color humor that made him a very popular act in this area. Great record. Digging this one - cheers.